In-place upgrade within OBIEE 11 versions (from .3 to .5 o r .6 or from .5 to .6) can be a whole lot quicker than out-of-place ones but are also more interesting in terms of potential issues arising. After two uneventful in-place upgrades from 11.1.1.5 to 11.1.1.6 I had a more challenging third upgrade with some unexpected errors. Command failed: NonJ2EEManagement Applicationdeployment failed. [Deployer:149163]The domain edit lock is owned by another session in non-exclusive mode - this deployment operation requires exclusive access to the edit lock and hence cannot proceed. If you are using "Automatically Aquire Lock and Activate Changes" in the console, then the lock will expire shortly so retry this operation. Caused by: oracle.as.config.impl.SimpleProvisionException: Failed to unregister instance instance1. It does not exist on the adminserver. 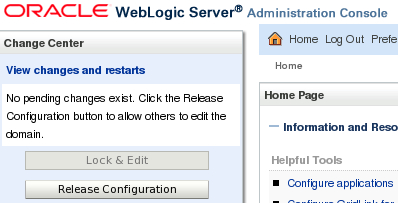 "Release Configuration" removed the immediate error source. Next step was re-running upgradenonj2eeapp.sh again to see what would happen and obviously the error "Failed to unregister instance instance1. It does not exist on the adminserver." still persisted since initially the first half of the script had run through and un-registered my instance. So off to some opmnctl commands to undo the damage. Task 1 initiated: [Deployer:149026]deploy application NonJ2EEManagement [Version=11.1.1] on AdminServer. Task 1 completed: [Deployer:149026]deploy application NonJ2EEManagement [Version=11.1.1] on AdminServer. Task 2 initiated: [Deployer:149026]deploy application NonJ2EEManagement [Version=11.1.1] on AdminServer. Task 2 completed: [Deployer:149026]deploy application NonJ2EEManagement [Version=11.1.1] on AdminServer. Successfully upgraded NonJ2EEManagement.ear and the registeration. Thanks Buddy ....You indeed saved a lot of time in debugging the issue. you've spared me many hours of work, thank you very much!